If there is one thing our life is not, it’s predictable. Acknowledging that each of us leads a very different life with very different challenges thrown in, let’s just assume that if you’re reading this, your life involves some level of unpredictability. Maybe you’re a doula, or you or your partner are on-call, or you only have one car, or you are a contract worker who doesn’t receive paychecks on a reliable schedule. Well, pretty much anything that could be unpredictable in our lives (aside from the roof over our heads and the number of people in our family), is. I’d like to share with you some of the strategies that we’ve found to help us, to the point where things in our life generally run smoothly. These are all points that need to be considered when putting plans into place. The first thing you need to do is think about your own worst-case scenario (no… not death. But a pretty bad day.). For us, that is both parents at work, no pre-arranged childcare or our pre-arranged childcare falls through, low on cash, short notice, and Justan needs the car very early in the morning so I have to get Neko to childcare and back to the store in time to open up in the morning, without a car. Have plans A, B, C and at least D in place for each factor so that you are never left hanging. Our situation is that thanks to Justan’s career in the film industry, we sometimes have as little as an hour’s notice that he’ll be headed to work. He may be working in town or out of town, for anywhere from an hour to two weeks. We only have one car, and our budget and scheduling constraints make part-time or full-time childcare less than ideal, not to mention the unschooling which requires that Neko is hopefully somewhere where she’ll get similar stimulation and socialization as she would at home. If both of our jobs also paid very little, the entire balance would be off and the situation would not work; however Justan’s work pays very well which makes the volatility worth it. That said, it has taken a LOT of getting used to, and I have never been able to find any articles or guidebooks out there to help me through it, so I’ve had to figure it out mostly on my own. I would love to see a book on managing finances when both partners are self-employed, but all the financial advice books I’ve read seem to assume a reasonably consistent wage. Try to match one parent’s work schedule to your childcare schedule. That parent also needs to think about transportation to childcare, and from childcare to their job. For us, I have matched my work schedule to my childcare schedule (after lots of tweaking, and seeking out the right situation). Justan’s work is the more unpredictable between the two of us, so I’ve set my store schedule to match the one that works for my childcare swap. If one or both of you is doing freelance or contract work such as writing, design work, or something else that you can do on your own schedule, this is a lot easier to do, as you can schedule client meetings, interviews and work time for whenever your childcare happens to take place. If both parents are freelance with flexible schedules, and can get your work done in 30-40 hours per week, building your schedule around one another, and tag-teaming on chores around the house might be a great option. As for the unpredictable nature of children, mainly meaning getting sick or hurt, this is where you’ll need to have some sort of emergency contingency plan built-in. For us, this doesn’t come up much as we have a very healthy and generally cautious child. However, when she does get sick, we assess the situation and talk to Nicole (our childcare swapper) and decide whether she wants to expose her kids to whatever it is; and we decide whether we have the heart to send Neko to someone else when she is sick. The nice thing about the childcare swap is that both families feel more like a big, extended family than childcare. When Mairead and Finn get sick I generally just tell Nicole to send them anyway – chances are we’ve already been exposed to the bug. We have chosen a few times to avoid the bad, puking bugs, largely because Justan happened to be off those days, and we had the option. We also have other friends that we can check with if needed – we would pay them to take Neko, but it’s an option when we don’t have anywhere else to send her. Our worst case scenario in this case (and my business partner, Jaime, has had to do this once if I remember correctly) is that one or more kids is sick and we simply can’t work that day, and our partner is either away or can’t get the day off work. This is when we have to scramble to make it work at the store. It’s very stressful, but we’ve always managed, even if it’s by the skin of our teeth. I once received a customer complaint after I took 4-year-old Neko to work with me after an employee flaked out on us and Jaime couldn’t come in because her oldest daughter was throwing up – I wish that customer could have known how close we were to having the doors closed that day! Some days, this is just the life of a small business owner. Which brings us, of course, to childcare. To me, this is the number one key. I need to know that I have Neko somewhere where she is happy and enriched. I like consistency for her in this aspect, because so much of our life is ever-changing. She handles it well (thankfully she is not a kid who requires a strict routine, or we’d have to make drastic changes), but I feel a lot better knowing that she is going to the same place on a regular basis and that she is happy to go there. This has been a long time coming! Up until last fall, we had cobbled together childcare at a dayhome (this also worked well, largely because my dayhome provider is amazing, and would let me know when she had extra space available and was open to drop-ins – she also lives five blocks from my house so was very convenient), through another swap (which was also great), and by paying friends to take Neko on the days that we needed it. Paying friends worked all right as well, except that I always felt like I was bothering people. If you do only need care once in awhile, paying random friends can work well. There are a few keys, though, to success (success being defined as actually finding care for your child, and also not losing friends). First, it doesn’t hurt to have a large network of friends. If they have kids, even better. No friend network? Or all your friends are without children? If you can find a local parenting group, that’s a good place to start. I belong to the Calgary Attachment Parenting Group and have since I was pregnant, and thank heavens I do. Let me be clear, here – do NOT join a group just so you can find people to provide childcare, or to help you move. Gross. I shouldn’t have to state this, but I’ve seen it happen – joining a group, or making friends, just so you have people to help you out, is gross. People will pick up on your ulterior motives, and you’ll be right back at square one. No, only do this if you actually want to make good friends, and if you expect to ever get help from anyone, understand that you need to be happy to help others and expect nothing in return. This also means that even if you help people all the time, you can’t get all passive aggressive and up in arms if people are unable to help you when you need it. But a lecture on appropriate actions within a friendship is better left for another day, so I’ll continue on trusting that you know how these things (these things being mature friendships) work. Okay, so let’s say you have friends now, and that you are generally liked and trusted and that you help people out when they need it. Now to find childcare, possibly on short notice, possibly in a pinch. Here, social media is your friend. I’m going to assume you’re on Facebook or Twitter or maybe even some sort of forum. If you’re not I’ll let you adapt this to your more Luddite lifestyle. Here is where we post with hope but without expectation. If you have a partner (or several?) and they can post as well, fantastic! I usually say something along the lines of, “Would anyone like a Neko to join them, 9-6 on Wednesday?” Simple as that. I may, though, sweeten the deal with whatever I can. “Will pay,” with or without the amount, doesn’t hurt. Or maybe, “I’ll take your kid(s) for a day in exchange!” This is usually appreciated. Or maybe you’ll provide dinner afterward, or you have something else to offer. Barter. Whatever you can give. The next step is really, really important. If no one responds, leave it at that. Please, for the love of cats, do not post a passive aggressive response along the lines of, “Well fine then, I guess I can’t work on Saturday.” It is not your friends’, nor anyone else’s responsibility to sort out your life for you. (Sorry about the lectures… I may have seen this happen before. It’s painful to watch. Don’t be that person.) This is your puzzle to solve and this is why you have Plan B (or C or wherever you are along the spectrum at this point in your day). Our next Plan when no one responds is to lay out our next options, depending on the situation. Can we reschedule some aspect of our work? Is there someone whom we think might be happy to take Neko who might not be on Facebook, or may have just missed the post? This is where we make a couple of phone calls just to check. I would also check with our dayhome if I needed to. And get creative! There is always shuffling you can do. Maybe someone can only take the kid(s) for part of the day, or it’s dependent on something. Think outside the box – what can be shuffled or adapted to make it work? There have been lots of days where Neko has been in the store with her LeapPad or a DVD for the first or last hour of the work day. My personal favourite set-up for childcare, not in any small way because it accommodates our unpredictability, is the childcare swap. I’ve already written an entire post on this so, rather than reinvent the wheel, how about you go read that here. Mairead, Neko and Finn spend a lot of time together, and it shows in their closeness and their bickering. Of course, a more traditional route such as a dayhome or daycare may work well for you, if you have a younger child. For the older, homeschooled child, things like classes, a blended program (where they go to school one or two days a week and school at home the rest of the time), or working on projects while you work are all options. This summer, Neko will be attending a couple of daycamps and sleepaway camps, and come fall she’ll be in classes through the Calgary Homeschoolers Association ever Tuesday. You can also look at the options for taking your child(ren) to work, depending on what you do. If you choose and design your own space, take this into account when you do so. Developing a child-friendly space can be worth it! I should also add that if you find yourself the sole parent much of the time, either because you’re a single parent or your partner is out of town often, it is really worth it to hire a babysitter to come one night each week. Even 2-3 hours gives you enough time to go unwind with friends or alone, and take a deep breath. Work out, grab a coffee, see a movie, or just wander through the grocery store without the incessant whining. It’s also a good idea to have at least one (ideally three) babysitters whom you can call when you’re in a pinch for a nighttime event or job. The underlying context to transportation is proximity. This is the first thing you should always look at when making fundamental changes (moving, choosing a job, and so on). We live five minutes from my store, so taking a bus or cab isn’t out of the question for me. The location of our childcare swap partner is another five minutes along the same road. It’s all workable. Don’t pick childcare or work or a house that is way out of the way unless you have two reliable cars, a lot of money, or just plain aren’t living this lifestyle. We have one car. Usually we can make this work by having one of us drop off the other, or one of us use public transit. One really helpful development has been that now when Justan gets a job out of town, he either carpools or requests a rental car. If you are a one-car family and one of you periodically or regularly works out of town, this could be worth a try. This has been life-changing for us – in the past, when Justan would go out of town and take the car, I would be without a husband and without transportation, but would still need to get to work, take care of the house, and do all the other things I am committed to normally. Let’s just say I drank a lot of wine then. Now the one-car issue is more of a problem when Justan is in town, and working. For days that we can’t shuffle things to make them work, I again have a number of contingency plans in place. First is the bus. I know my transit schedules and I know them well. I know the exact times I need to be at the stops to make things work the most efficiently, and which stops and routes work best depending on the situation (do I have Neko with me or not? Are we going in in the morning or afternoon?) and weather. I got the free Calgary Transit app for my iPhone (a smartphone also makes our life a lot easier, as we can locate each other at any time, and change plans on the fly) and use it often. I also always carry a pair of headphones in my bag so I can listen to music or play games on my phone on long bus rides, in case I get bored. 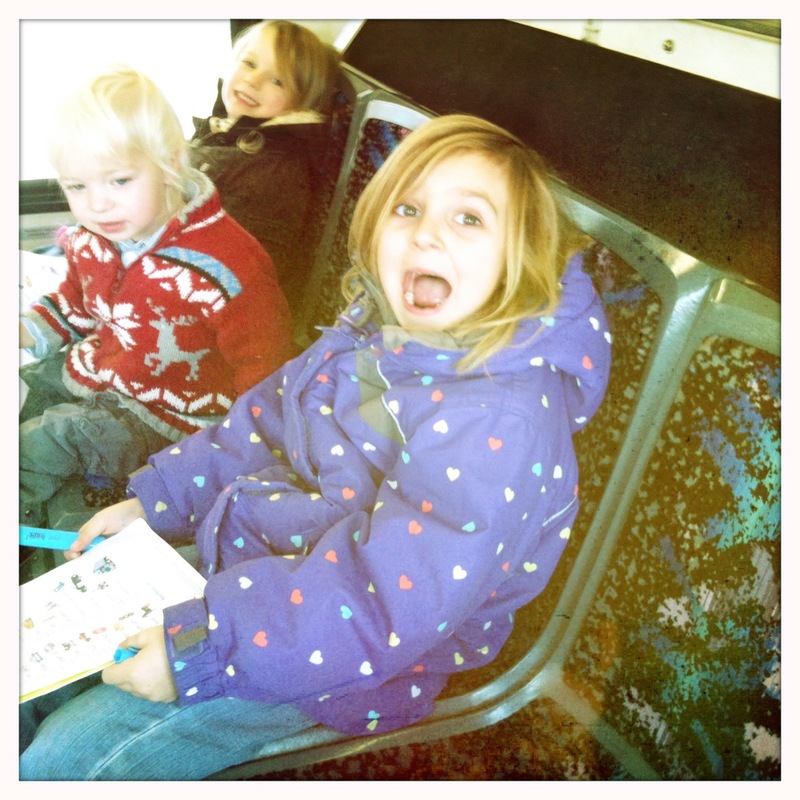 Finn, Mairead and Neko on one of our epic bus journeys. Bus bingo helps! When I’m completely stuck, we cab. The downside to this, at least with younger kids, is that you may not have a carseat available. I didn’t cab much when Neko was under booster seat height/weight, but I may have once or twice when I absolutely had to. This is our we-missed-the-bus-and-if-we-wait-for-the-next-one-I’ll-be-45-minutes-late-for-work option. It’s expensive, and you may lack a child seat, but when worse comes to worse, it’s good to have cash or a credit card (with available space) in your wallet so you can call a taxi. Another reason I need my cell phone! And did you know that by dialling #TAXI (anywhere in the USA and Canada) on your cell phone, you’ll be connected to the first available taxi company? So handy. Another tool I have worked into our transportation options is foot power. When Neko was younger, I had a child seat on the back of my bike and would ride the approximately 15-20 blocks to the friend’s house where Neko was going for childcare at the time, when we didn’t have the car. From there I knew which bus to take to get to the store on time. Now, when I bus to Nicole’s, I find it just as fast, or faster, to run the 4K from her house to the store as it is to wait for the next bus and catch that. If I commute on foot to and from her house in the morning and afternoon, I also get in an 8K workout that day! (Not recommended unless the distance is comparable to something you would normally do.) To make all of this more possible, it pays to be prepared. On the bike you want a small backpack packed, and while running I find it ideal to have nothing on me in the way of a bag. Keep supplies for your child (clothes, diapers, bottles, etc) at their childcare, and keep extra clothes and some food at your place of work. When we had a freezer at work I would keep one dozen Amy’s frozen burritos in there and a jar of salsa in the fridge, so I always had lunch on hand. 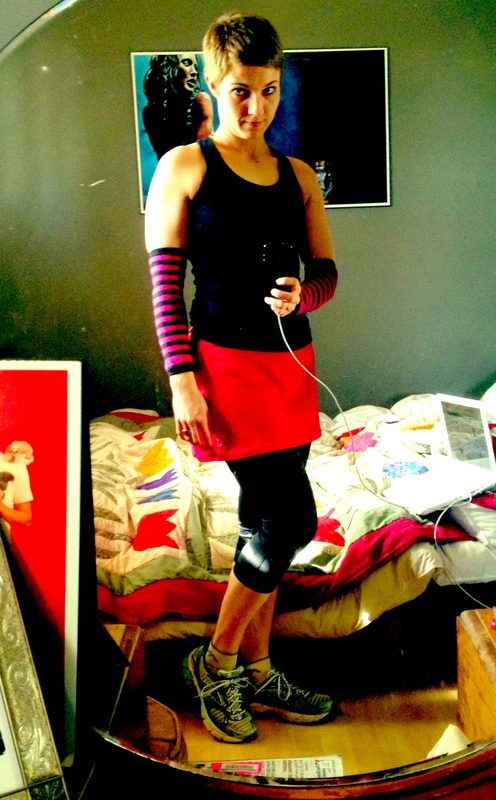 If you see this girl running along Glenmore Trail in the morning, I’m on my way to work. Tricky one! What a loaded factor. Obviously I can’t speak to your money issues, but I can offer a couple of tips. First, plan for the worst case scenario. Have I drilled that into you yet? When choosing a place to live, assume you’ll be making the smallest amount you could make in a year, just shy of forcing you to change careers. I won’t go into safety nets like insurance and such here, but basically build in as many safety nets as you can. You have a kid(s) relying on you now. While you may be able to survive with rotten teeth, freezing to death on a bare mattress, I doubt you want that for your offspring. When we applied for a mortgage in 2005, they approved us for $200,000. We scoffed. We couldn’t afford to pay that much in mortgage payments each month! In the good times, sure, no problem! But it’s not always good times. And we knew that as soon as things dried up for a period of time, we’d be behind on mortgage payments. We chose a house for $145,000 in an area of town with more… er… “character” (we love it, by the way), with just 650 teeny tiny sq-ft of space and a nice, spacious yard, and we have thanked our lucky stars ever since that we bought the house we did. There was one year (I think it was 2009) where even this felt like too much. Justan was out of work for six months and to say we barely scraped by would be the understatement to end all understatements. If we’d had a 30% larger mortgage we wouldn’t own a home now. Make do, make it work, and make the best of it. Same goes for cars, using savings to go on vacation, and so on. There is a reason we don’t have a second car! 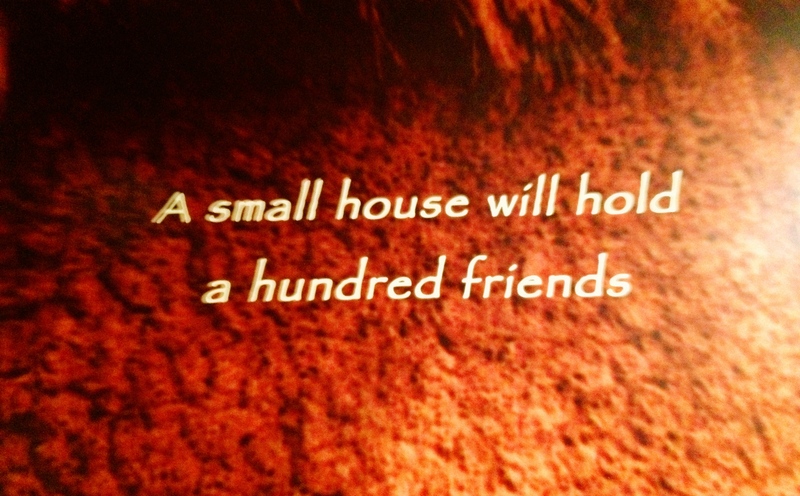 This quote is on the wall as you enter the Africa exhibit at the Glenbow Museum. I love it. Second, stock up on food. We belong to a food co-op, and I also freeze a ton of produce in the summer. We have a few months’ worth of food in our basement (this works well both for disaster/zombie prepping as well as a freelancer’s lifestyle! ), including dried beans and legumes; flours; dried and canned and frozen fruit; tea and coffee and juice and almond milk; pasta and rice; canned beans and sauces and coconut milk; frozen meat; frozen broth; tortilla chips and crackers and rice cakes; popcorn; oils; sweeteners; and so on. This winter, Justan was pretty much completely without work for three full months and we survived off savings, credit, my small wage, and our food stores. We could have survived on the food stores a lot longer – we just ran out of money to pay bills and the mortgage. But we never went hungry! What a huge load of stress off our backs. Third, yes, put aside savings. Whenever you can, either pay down debt (highest interest rate first!) or squirrel away money in savings. You’ll never regret putting money in savings or another form (again, making space on that credit card) that you can access when the going gets rough. Fifth, say it with me now, contingency plans! Here is where unjobbing shines. Know your options! Networking is great. Talk to people and over time, collect ideas for places where you could do temporary or seasonal work when you’re in a pinch. Always have job options on hand. During that six months that we came close to selling our house, part of our survival depended on being paid cash under the table (shh) for landscaping work I did to help a friend out with her landscaping business, and Justan working with a neighbour with his playground building business. I also babysat for friends whenever possible. These little skills and services can float you through the hard times. If you have to, make a list of skills you’ve got, and people you know, and take note of any opportunities that might exist. If those people can’t give you work, they might know people who can. And sixth, barter. Have skills and items available to give or lend that will get you services and items in return. I won’t actually speak to health, because it’s so varied and you know your own situation. I will say, though, that you must allow for proper sleep, and nutrition. Being busy is no reason to cheat yourself on sleep or food. Make plans in advance, have nutritious, frozen or takeout meal options in mind, and be sure to get the sleep you need, or you’ll pay the price, and it will make things so much worse in the end. In closing, I’ll say that tonight, we had a worst case scenario night, and it all worked out just fine. Are we tired? Absolutely. But it worked out, we got where we needed to be, we did what we needed to do and no one was especially stressed out (except Justan, but that was because a key piece of equipment broke down, which made his life a lot more complicated). If you’re currently struggling to make a complicated situation work, I hope that some of my suggestions have got your wheels turning. Often, things can work out, it’s just a matter of a little creative thinking. Planning and a long list of back-up plans are crucial, and you may find yourself sitting on a bus with your child patting yourself on the back for having so many effective back-up plans. I’d love to hear about strategies any of you have put into play to make your unpredictable life more manageable! Unjobbing – eschewing a conventional career curve to cobble together a living from your passion(s), often through creative scheduling, living simply, or generally thinking outside the box – can be a fun and exciting way to live as a student or single person. But often it becomes more difficult if/when you have children. For some, becoming a parent can be a catalyst for the unjobbing lifestyle: in a two parent family, one parent can work a full-time job while the other works from home, runs a home business, does contract or freelance work, or works in an art or craft for extra money (or all of the above). Most often, moms fall into this category, and the jobs might include doula, home party sales rep (though there’s usually more free products than money in this line of work), house cleaning, book keeping, odd jobs, freelance writing, photography, teaching of different types, or childcare. This could also include, of course, the many industry-specific jobs a person might tailor to fit their life – taking your regular 9-5 (or whatever) and working half days, or partially from home, or consulting, or freelance, or job sharing. The trickiest part of it all is the childcare. Unless you’re working a regular shift that is compatible with a daycare or dayhome, or you have a partner or family member whose schedule works well with yours, a lack of good childcare options can be prohibitive to being able to work at all. Even when you do have access to childcare, the cost can mean that you’re ending the month with only a few dollars of your wage remaining in your pocket. Enter the childcare swap. I’m honestly amazed more parents don’t utilize this. It’s kind of a combination of running a dayhome (only with very few children, and with no money changing hands – like a form of barter!) and working. With luck, you can choose someone whom your own child loves, and whose child(ren) complement your own family and actually make your life easier (amusing your own kids while they’re over). Here’s how it works (it’s really simple): the two of you decide how many days per week you would each like to work, up to 3.5. Generally 2-3 each works best, though you could alternate with one of you working two and the other three one week, and then the next week switching. While one of you works your set number of days, the other has your kids, and then on the days the second person works, you take their kids in exchange. I’ve done this twice, successfully. The first time, there were three of us, each with one child. I had Neko, 3, Renee had Eve, 2 and Rachel had Hazel, 2. On Tuesdays, Rachel would take Neko and Eve from about 9-5. On Wednesdays I would take Eve and Hazel. And on Thursdays, Renee would take Hazel and Neko. The really nice thing was that the three girls became really close and loved the consistency; they each got the benefit of each mom’s strengths (and the dads sometimes, too); and each house had different things to do and a different playground or park nearby. We three moms did one day of childcare each per week, in exchange for two days that we could work. I’m currently doing a swap with Nicole, who has Mairead, 4, and Finn, 2. (Neko is almost 6 now.) She has Neko all day Tuesday, and Wednesday afternoon, and I have her two all day Thursday, and Friday afternoon. This is working especially well as Nicole works at my store, so we also have the consistency there. 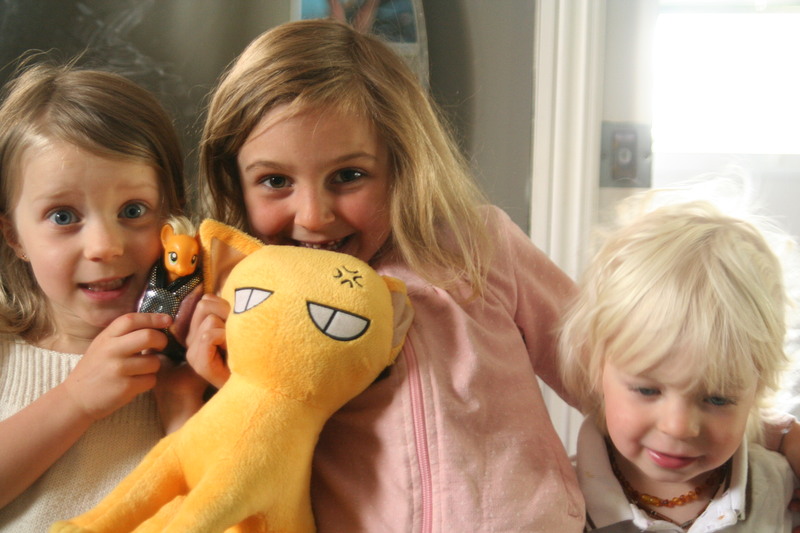 Our kids get along great and I love sending Neko to her place, and having Mairead and Finn at my place. I also like this set-up since Neko is an only child (and homeschooled), so it’s like she has siblings half the week. It can be tricky to find someone who lives close enough (especially important to us, only having one car), has compatible kids and parenting, and whose work schedule might work with yours. But it’s doable, and I really think it’s worth it. This arrangement gives Neko and me, as a homeschooling family (or when she was younger and not in school yet), the freedom to do the same things we would have been doing on my days off (playdates, taking in performances, going to the museum or science centre, going for walks, visiting the library), only it’s better because she also has other kids to play with. It also allows me to work and not scramble for babysitters. This is a problem for me otherwise as Justan’s work schedule is sporadic and unpredictable (he does location sound recording for TV, documentaries, commercials, etc), so we don’t always need a babysitter. And paying by the day can be pricey! I also hate being that person who is always posting desperately on Facebook asking people to look after my kid. I have this idea for a childcare swap match-up site… but the idea would have to be a lot more popular first. Until then, putting the idea out there to friends, posting on parenting forums (I would use my local attachment parenting group), or approaching others in your line of work or on mat leave at your place of employment are all ideas that might get you some leads. 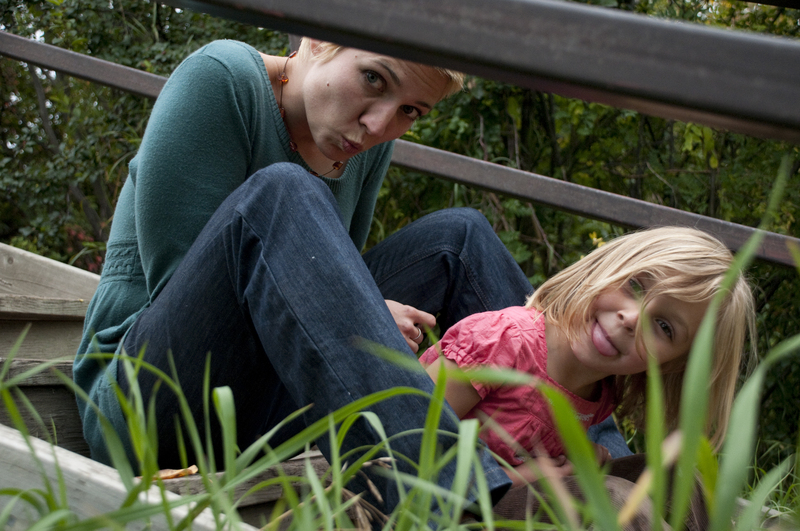 For homeschoolers: as you’re aware, once a child reaches school-age, childcare options narrow. In my experience, my friends have taught Neko things and exposed her to things I might not have thought of, or been able to. The moms I’ve swapped with have varied backgrounds and strengths. At one house, kids might swim, ride bikes, play in the yard more; at another there might be regular dance parties, crafts and baking; while another house might be the place for science experiments, nature videos and hikes. I don’t have to worry about Neko not being enriched while I’m at work, especially since we’re unschooling. There is a bit of a social aspect to this, if you want there to be. Usually, mornings are just drop-off, and afternoons are just pick-up. But when time and circumstance allow, there can be shared family dinners or at least time for a visit and a cup of tea at the end of the day. I like seeing my friends regularly, even if there is only time for a five minute chat. I get inspiration for activity planning. I find that when it’s just Neko and me, I fall into patterns (as does she), and we sometimes have a hard time thinking of things to do day-to-day. But (and maybe this is the camp counselor in me), when I know I’ll have several kids in my care, I snap into teacher mode and start planning fun activities. Ironically, I’m more apt to do a craft or experiment with three kids than with one. Right now, I have theme days and outings planned already for the whole next month, and I’m really excited about all of them! I feel very strongly about building a “village” – a support system of friends and family who can help each other in times of need, be there for social interaction, share traditions, and, when kids are involved, provide an extended family where it might not exist otherwise. This is where my “social change” platform comes in. Whether you’re single, coupled, poly, with kids or without (or with them part-time), young or old, a community is important to everyone in it and even those who are just on the periphery. Small “tribes” of likeminded people can form little urban families, a lifestyle that is more well-suited to many people today, especially in an urban setting. Childcare swapping fits in extremely well in this type of scenario.